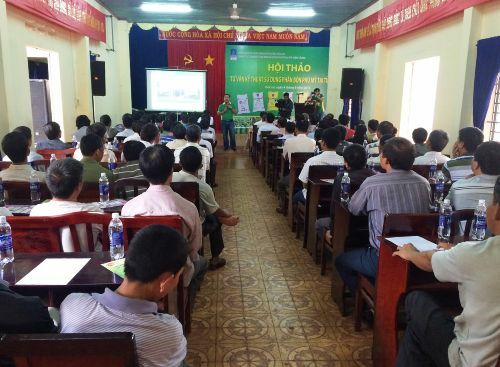 Dozens of farmers and agents enjoyed a seminar on Polysulphate™ fertilizer held in Gia Lai province, in the central highlands of Vietnam this month. Vietnamese agriculture employs more than half the population in a highly productive and diverse farmed landscape. But the sustainable achievement of quality and quantity of a wide range of crops is only possible with careful and precise fertilizer use. The Petrovietnam Fertilizer and Chemicals Corporation (PVFCCo) has built up a significant distribution network focussing on four fertilizer & chemical companies in the country’s four key regions. The network now includes 90 branches and wholesalers and about 3,000 retailers located throughout the country and Polysulphate fertilizer has become an important part of the portfolio they offer to farmer customers. Wanting to make fertilizers, including Polysulphate, available to farmers at reasonable price and best condition is one part of the process. The other part is ongoing training and advice for farmers on how best to use these inputs in their businesses. Polysulphate fertilizer is being particularly promoted for use in the growing of coffee, pepper, jack fruit and passion fruit. The seminar for farmers and advisors this month in Gia Lai province, held by PVFCCo with support from ICL, is the latest in their ongoing series of farmer training events to share the results and the practicalities of using Polysulphate on crops in Vietnam. Through talks and presentations, interactions and interesting discussion the farmers returned to their farming with minds filled with practical advice and information.